The ultimate movie-ticketing destination can now be found on your iPhone and iPod touch. 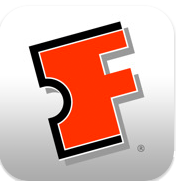 Get movie and theater listings with the flick of your finger. Watch trailers. View fan ratings. All while the device’s core location feature finds the theaters closest to you and the movies playing at them. And when you’re ready to buy, it’s as simple as, well, 1-2 with our super-quick purchasing that secures your tickets fast and drama-free. Ladies and gentlemen, It’s Showtime! This entry was posted in AppMinute Podcast, iPhone App and tagged in Android App, Android News, Apple News, Droid X, iPad App, iPad News, iPhone App, iPhone News.